We’ve picked the four best RV portable waste tanks, plus one holding tank treatment to help you make your vacations as stress-free as possible. We’ll take a look at the different types of holding tanks on your RV, how to transfer fluids from these into a portable tank and which accessories you’re going to need. How To Transfer Fluids To And From Your Portable RV Tank? What Chemicals Are Used For Black Tanks? What About RV Tanks During Winter? This Barker RV portable waste tank ticks all the boxes. This tank comes fully assembled and ready to go, complete with bayonet fittings, tow handle, and a five foot sewer hose. The double wheel design at the front is incredibly well thought-out. These front wheels are placed close together and can easily be pivoted using the long handle, so moving your full Barker waste tank is a breeze. The three inch valves remove the need to lift your tank to empty it, which is a great benefit as these tanks can get pretty heavy when full! A huge number of positive Amazon reviews mean you can feel confident when purchasing this tank. With over 400 reviewers rating this tank as a five star product, the Barker Tote Tank is easily our pick of the bunch. Be sure to buy the new and improved model with heavy duty air-filled rubber tires. This 32 gallon Tote-N-Stor is perfect for any RV trip. Strong yet quiet rubber wheels to the rear of the tank combine with a tow bracket at the front to allow easy transportation. 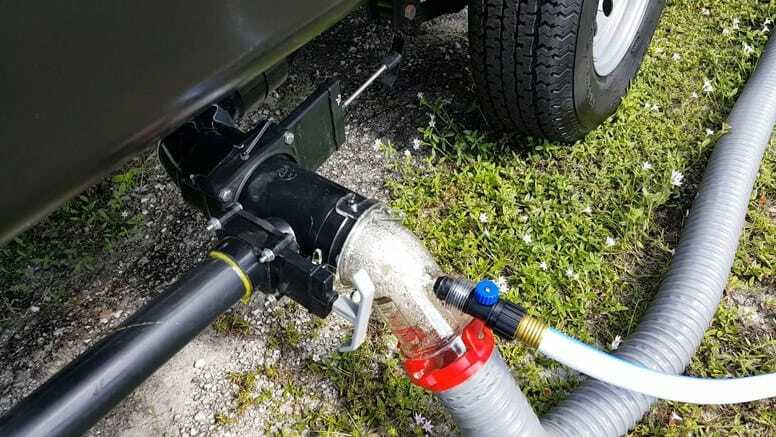 This portable tank comes with a handy in-built storage compartment, in which you can place all the fittings needed for emptying your RV tanks and transporting the waste. There are a good range and number of reviews for this portable tank, so you should be able to buy with confidence. Some reviewers note that due to its large capacity, this portable tank is pretty heavy when full. Luckily, it’s also noted that it’s easy to attach to the how hitch on your vehicle. One drawback is that the Tote-N-Stor portable tank doesn’t have a gauge to indicate how full it is. Once you get familiar with the process of emptying your RV tanks, you probably won’t find this a problem. But if you select this model, take care during the first few uses, to make sure you don’t overfill it and risk an overflow. This chunky and rugged Thetford waste tank has four wheels for easy transportation by hand or vehicle. The front two wheels are attached to the handle, which allows you to pivot the fully loaded tank easily. The angled handle at the front can easily hook onto a trailer hitch for towing. The Thetford portable waste tank comes with a pre-attached sewer hose which is a definite plus if you want to use it straight away. This hose folds away into a dedicated compartment, along with the included 90 degree elbow joint, handle and cap. This compartment is built into the rear of the tank. The integrated gauge makes it easy to judge how full this tank is to put an end to any overfilling worries you may have. There are not as many reviews available for this portable tank as some of the others we’ve reviewed. Despite that, many users seem happy with their purchase. Others have commented that the handle is not very durable and prone to break when the tank is full. This Barker portable waste tank has a 30 gallon capacity meaning it’s suitable for longer trips or simply emptying your tank without having to move your RV. It comes complete with a five foot sewer hose, bayonet cap, hose adaptors, adjustable clamps and a drain hose. Everything you need to use this tank! The majority of reviewers seem very happy with this tank. One downside that some reviewers have commented on is that this tank can degrade quite quickly when exposed to sunlight. So if storing outside, that’s something to consider. Being a bigger tank, this is going to be quite heavy when full. Unfortunately, this portable tank doesn’t come with a handle to attach to your hitch on a vehicle. So you have the option of towing by hand or purchasing the additional handle which allows for hitch attachments. This organic treatment for your holding tank is marketed as the most effective neutralizer of RV tank odors, while also being cost effective. Made up of an organic and biodegradable blend designed to help keep your RV black and gray tanks functioning at their very best. This treatment is made up of a concentrated mixture of monohydrate minerals and micronutrients. Once activated by water, these help to break down waste while also minimizing unpleasant odors. We were impressed by the high number of very positive reviews left about this product! Many users are indeed happy campers after using this holding tank treatment. This treatment seems to work well in both hot and cold weather, although if you’re camping in summer, you can expect a small amount of odor. However, this will likely be less than with other brands. One of the great things about having an RV is the freedom to explore far-flung places while having all the comforts of home with you. But another aspect of any RV holiday is managing your waste. To enjoy any vacation to the full, many RVers choose to purchase a portable RV waste tank to make this necessary job a little easier. Hitting the open road in your RV is a great feeling. But as with any trip, there are certain practical considerations that you need to consider. Including where exactly the waste from your sinks and toilets will end up when you’re not connected to a sewerage system. Any waste water from your toilet, sink, and shower is kept within specific holding tanks within your RV. This is then dumped out at waste stations. You can also dump waste water to your own septic tank via portable tanks. One problem can arise if you plan on remote camping in your RV for an extended period. At some point during this trip, your waste tanks will probably need emptying. Unfortunately, this can sometimes cut your trip short. 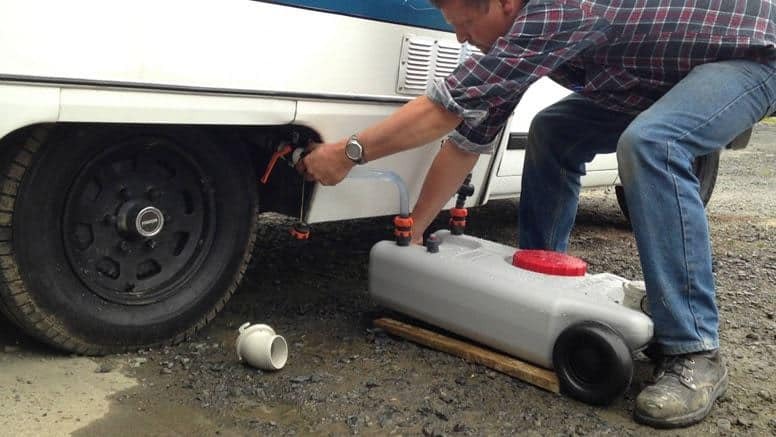 With a portable RV tank though, it’s not a problem! These tanks are designed to hold waste until you get a chance to visit a dumping station. This means you can spend longer enjoying the great outdoors without having to worry about cutting your trip short to get to a waste station before your tank fills up! Many RVers on camping grounds also find that portable tanks are a great choice for simply transporting waste from their RV to the dump site. Sometimes gaining access to the dump site with your RV can be a little tricky. A much easier option is to empty your waste tank into a portable tank and then transport the tank to the dump site. Let’s run through the different types of tank that you will find on your RV, along with what each tank is designed for. Each tank needs cleaning and sanitizing on a different schedule, so make sure you build this into your regular list of RV maintenance jobs as well. Let’s move on to the types of tank you’ll find on your RV. This one is pretty self-explanatory. Your RV water tank is designed to hold clean, fresh water. This is used for drinking water, showering and washing dishes. The hoses for your RV water tank are white, which shows that they are for use with potable water, suitable for drinking. You might be tempted to use a clean garden hose to fill up your water tank, but these can make your water smell bad as well as potentially leaching chemicals into the water as you fill up. The potable water at some camping grounds may not be as clean as you would like. Most water tanks come equipped with a filter which can remove dirt particles as well as bacteria from water. It’s worthwhile checking this is the case on your RV. You should also clean your water tank regularly to make sure it’s fresh and clean. Within your maintenance schedule, you’ll also want to set aside some time to completely flush out your water tank at least once a year. Many people do this when they take their RV out of storage at the start of the season. 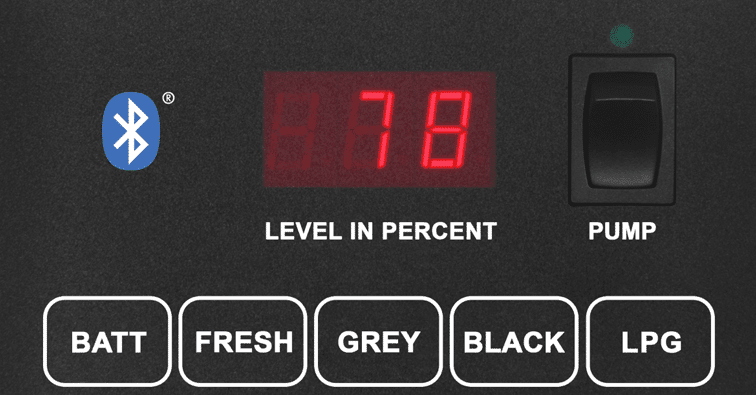 Your gray tank holds water that has gone down your shower or sink drains. This includes water used for washing dishes, cooking, and showering. The water is known as ‘gray’ because while it’s been used, it’s not completely dirty. This means that you can dispose of it in some different ways, including connecting to a sewer line at larger camping grounds or flushing out into vegetation where allowed. Because this gray water can contain particles of food and other waste, odors can build up in the tank. There are a few different options for minimizing this, such as using a tank treatment and flushing your tank out thoroughly when you empty it. Gray water is kept separate from water that is used to flush your toilet. This is known as black water, which we’ll look at next. The black tank in your RV holds water and waste that comes from your toilet. You can only dump this tank at special dump sites designed to deal with black water. It’s extremely important to make sure the dump valve of your black tank is tightly closed when you’re not in the process of emptying and cleaning it. This is because if the water slowly drains away, you will be left with an accumulation of solid waste which will eventually cause a blockage. This becomes very difficult to clean away! You can buy chemicals to add to your black water tank. These are designed to control odor as well as helping to break up the solid matter. This makes it easier to empty your black tank when the time comes. You can also buy specific toilet paper for use in your RV. This more biodegradable than standard toilet paper, meaning there’s less chance of blockages developing in your black tank. As already mentioned, portable tanks give you the flexibility to extend your trip by giving you the option of emptying your gray and black tanks during your trip. We recommend always travelling with a portable RV tank, even if you think you may only use it occasionally. These portable tanks come in a range of different sizes, from small tanks which can only hold around six gallons, all the way up to tanks capable of holding up to 32 gallons. You’ll find that larger tanks come complete with wheels for easy transportation to a dump site. Some tanks will have two wheels at the rear and a strong integrated carry handle at the front. These are usually designed to be towed by hand. Others have four wheels and a longer tow handle. These can also be towed by hand, but many RVers also attach them to the hitch on their vehicle and will drive slowly to a dumping station. It’s a good idea to consider which method you would prefer using while considering which design of portable tank to buy. These tanks are a great option for RVers at both camping grounds and remote sites. At camping grounds, it’s often much easier to transfer the waste from your grey and black tanks into a portable RV tank, and then take this tank to the dumping station. Many portable tanks come with wheels and a tow handle, meaning you can pull them around to any dumping location. You have the option of pulling them by hand; although many RVers choose to tow them with a vehicle as depending on the size of your portable tank, they can be pretty heavy when full. Some portable tanks come with a sewer hose, for others, you will need to purchase one separately. A clear sewer hose elbow is a useful addition to help you see when your tank is draining clear. These are available in a variety of angles such as 90 degrees or 45 degrees. It’s worth setting up your system to find out which angle will suit you best. A sewer hose support is not essential but is very useful to keep the sewer hose off the ground and help maintain a downward slope which will make draining your tank much easier. The outlet for both the gray and black tanks is usually the same. There will be two valves above the outlet, usually labelled ‘waste’ for gray water and ‘sewage’ for black water. If you need to dump both tanks at the same time, dump the black water tank first. Doing this means you can use the gray water to do a partial flush of the sewer hose, helping to get it cleaner, quicker! Now your portable tank is full of your wastewater, let’s take a look at where to dispose of it. The only place it’s permitted to dump the waste from your black tank is at an official dumping station. Most camping grounds will have these, although the access to them is not always the greatest. That’s why it’s best to have a portable tank which you can tow to the dumping station. With water from your gray waste tank, you have a few potential options. Some camping grounds will let you leave the valve to your gray tank slightly open so that it slowly empties out onto the ground. At other grounds, it may be possible to empty the gray tank into some vegetation. These are not accepted methods everywhere, so make sure to check. And if in doubt, empty your gray water tank at an official dumping station. Each of your RV tanks needs regular cleaning. Let’s take a look at how to clean your water, grey, black and portable tanks. Make sure you drain and clean your water tank regularly. If you don’t, the water can quickly become stagnant. This is very unpleasant to drink as well as potentially harboring dangerous bacteria. Because gray water from your sinks and showers contains oil, grease and food particles, over time, this can build into an unpleasant odor. There is a range of environmentally friendly chemicals which you can put down your drains to both break down residues and reduce odors. As an example, the Happy Campers Organic RV Holding Tank Treatment featured above consists of an organic blend of water activated minerals which neutralize odors and help keep tanks sparkling clean. You simply need to mix one scoop well with plenty of water and pour down your shower and sink drains. It’s recommended to do this every time you empty your tank, as this will help keep the build up of residues to a minimum. When you empty your gray tank, you can also put some dishwashing liquid down your drains to help remove the build up of grease. It’s a good idea to get into the routine of cleaning your black tank every time you dump the contents. There are many cleaning products out there, but again, we think the Happy Campers Organic Holding Tank Treatment is a great choice. For this product, simply fill your toilet with around one gallon of water. Sprinkle one scoop of Happy Campers powder per 40 gallon tank capacity into the toilet. Add another gallon of water before flushing. The first time you use this product, it’s suggested that you double the amount of powder for a deep clean of any residual waste. As well as regular cleaning after each time you empty your black tank, you might find that over time stubborn build-ups reduce the efficiency of your tank probes. This means the reading on your monitor may not be accurate. An easy way to give your black tank an extra clean is to flush a couple of bags of ice cubes into your empty tank. Take a drive around the block and let the ice cubes scrub away at any build-ups. Once the ice cubes have melted, you can drain the tank as normal. If you’re having ongoing problems with the tank probe of your black waste tank, it could be worth getting it professionally cleaned. Calling in a professional with specialist equipment to identify any blockages, residue and build-up can be a great choice in this kind of situation. After you’ve used your portable tank, rinse it out using a hose. Leave the valve open and flush enough water through until it’s running clear. You can also add a disinfectant to keep your tank smelling fresh. There’s a huge range of specialist chemicals available designed to help you clean out your black tank. The majority of these help to control odor and break down waste. Environmentally friendly and organic options are a great choice, especially if you want to minimise the number of chemicals you’re flushing into the sewerage system every time you empty your tanks. Enzyme based chemicals are also an option. These add ‘good’ bacteria to your black tank, This helps digest waste and reduce any unpleasant odors. Some treatments for your black tank contain formaldehyde. This chemical is used to aid the breakdown of solid waste, and while it’s effective, it is also dangerous to both people and pets if not used in the right way. We recommend choosing an environmentally friendly product wherever possible. Struvites are formed when the gases released by waste mineralize into hard crystals. This can be from ammonia in your black tank, or phosphates from soap, detergents and food waste. These struvite crystals can coat the inside of your tanks and pipes. A build up of struvites within your black or grey tank is a problem for some reasons. If struvites form over and around the sensor, this will fail, and you will be unable to tell how full your tank is. They can also cause a build-up of bacteria, which means your tank will soon start smelling particularly unpleasant. There are a variety of products on the market which can remove or disperse struvites. You can normally tell if these are working effectively by observing the color of the discharge as you flush your tanks. If it looks gray or sandy, then that’s a good sign that the struvites are being broken up and flushed out. Another option is to have your tanks professionally cleaned. This is a great option if you have bought your RV second-hand, as it will be hard to know whether or not there is a build up of struvites within your tanks without professional help. The hoses of RV tanks are more likely to freeze during winter. Protect them by wrapping with a form of insulation, such as electric heat tape. The majority of holding tanks are double insulated, which should protect them from freezing to some degree. If you’re at a campground with electric hook-ups and the interior temperature of your RV is above freezing, you shouldn’t have a problem. On the other hand, if you’re boondocking in the winter and the temperatures drop, it’s a good idea to be prepared. Stock up on some non-toxic antifreeze, specifically designed for use in RV tanks. The instructions will vary depending on the brand, but as a rough guide, you’ll be looking at adding two quarts to both your gray and black tanks. Do this after you’ve emptied and cleaned your tanks. Pour the antifreeze down your toilet (black tank) and shower drain (gray tank). Over winter, try to maintain a more frequent dumping schedule. Aim to empty both black and gray tanks when they are no more than half full. As your tanks fill up again, add more antifreeze. Another option is to invest in heater blankets for your RV tanks. These wrap around the tanks and plug into your electricity supply. There’s a variety of accessories you’ll want to consider to go along with your portable RV tank. To fill your water tank, you’ll need a white hose, suitable for potable water. It might be tempting to economize and use a cheaper garden hose, but don’t do it! These can leach chemicals into the water and leave a nasty taste. A sewer hose is necessary for emptying and flushing out your black and gray tanks. Because these tanks share the same outlet, the sewer hose can be shared between the two, but be sure to disinfect this hose thoroughly before storing. It’s also a good idea to have a dedicated hose for flushing out each of your black and gray tanks. There’s a wide range of chemicals available for use in your RV tanks. Bleach can be used to disinfect your water tank. Often the same chemical can be used to clean your black and gray tanks. Usually, it’s recommended to use a treatment every time you empty your black and gray tanks. Many RVers also like to have a heavy duty cleaner to use once a year. Most RV tanks come complete with a sensor which indicates how full your tanks are. You’ll usually want to empty your black and gray tanks when they’re around two-thirds full, although in winter this can be only half full. If tank sensors get covered by debris, then they can stop giving accurate readings. Try flushing the tank and following our instructions above for giving it a good clean. Your portable RV septic tank will attach to the gray and black tanks in your RV via a valve. It’s a good idea to check this every time you empty the tanks. If the valve looks leaky, or the sewer hose is not connecting properly, the valve may need to be replaced. Portable tanks come in many different sizes, so be sure to choose one that suits your individual needs. The size of portable tanks will usually be given in gallons. If you take extended vacations or have a large family, then a bigger tank might suit you. At the other end of the scale, if you are a couple who only uses their RV for short mini breaks, then a smaller more lightweight tank will probably suit you better. Whichever material your portable tank is made out of, it should be durable and hard -wearing. Tanks can be subjected to sunlight which can degrade plastics, making them crack after a few seasons of use. You want to pay attention to the maneuverability of your chosen tank. Take a look at how many wheels your chosen tank has. Those with pivoting wheels at the front are often easier to maneuver. Check where the inlet and outlet valves are on your chosen tank. It’s easier to empty your tank if the outlet is on the side, as you won’t need to lift the tank. Before you buy an RV portable waste tank, think about when and where you’ll need to empty it. If the dumping station is a long way away, a tank with a hitch attachment could be what you need. If you take long boondocking trips, then a larger tank may suit you better. Whether you love boondocking or staying at camping grounds, a portable RV tank can make your RV lifestyle easier. By choosing a model to suit your needs, you’ll soon find this piece of kit is essential. If we’ve missed your recommendation off our list, or you’ve got a great tip for cleaning RV tanks, be sure to leave us a comment below.